150 Hp, 6 turbo cyl DAF Diesel, with a second engine for spares. Ex commercial barge refitted for a live aboard Péniche. A huge boatsman's cabins in the aft of the wheelhouse is organised on 2 levels, a galley and a heads & shower on the first level, and below a saloon with a sofa bed convertible into a double bed and 2 separated cabins (one double and one single). headroom in this aft studio is 2m. The lodging is accessible from the huge terrace leading down by a central staircase to the large saloon lounge galley (around 50m2) headroom 2.60. An open space, bright with round windows and the skylight from the staircase. A starboard hall leads to the 2 cabins (master cabin and two single beds cabin), shower & separate heads. A huge dressing room. from the foredeck, access to a separate crew cabin currently used as storage room. on the aftdeck, a separate utility room (workshop and washing machine). CUENOD central heating diesel unit producing hot water through radiators and domestic hot water. Lots of storage on deck, and a huge covered terrace to entertain. forepeak crew cabin and engine room fitted with water alarm. 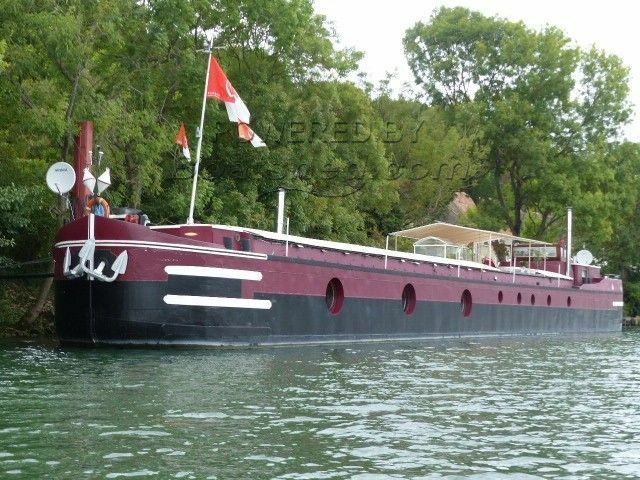 Live aboard barge for sale in France. Boatshed Paris is happy to offer this 1957 Forges de Strasbourg barge Freycinet type for sale in south of Paris. Recent paints, hull and superstructure. Huge living area below the huge terrace, with a magestic staircase access from the terrace. Open American galley in the cosy and modern lounge leading to the night area (two cabins and storage room). A completely yet separated boatmans' cabin accessible from the wheelhouse can accommodate up to 5 persons. And on the forepeak, a crew cabin with private access with shower & heads. A great boat for a family who want to live afloat and occasionally cruise in a great comfort. have a little bed and breakfast activity. This Freycinet barge has got its Certificat communautaire (= triwv) valid until June 2022.